Normally I don't blog about my aging computer that in real life it is 6 years old but in computer life is probably 90! But, this time I am and I do this not only for the benefit of anyone trying desperately to play their favorite radio station through their computer, but for myself. Yes, I actually do refer back to my past blogs to remind myself of how to do something that I've already blogged about. Ok, so the dilemma is and I don't know why this happens and I do recall it happening once before; suddenly without warning the sound simply doesn't want to work any longer. It looks like everything is playing; no errors, no signs that something is wrong, no puff of smoke nor the smell of burning electrical wires from the speakers or anything. Yes, this has happened to me in the past and I recalled that the fix was so simple yet so hard to find on the net and this time was no exception. I Googled "sound not working on computer" and I got so much mumbo jumbo from uninstalling drivers to plugging in different speakers/headphones to buying and installing a new sound card that it was enough to make my head spin. People, I'm here to tell you that if your situation is anything like mine listen up! It's probably that somehow, some way, don't ask me because I never touch these controls, but somehow 1) the mute button got pushed or 2) the Wave volume slider is turned all the way down. FIX 2) Click the Advanced button which opens the Master Volume window. Make sure none of the volume sliders are all the way at the bottom especially the Wave slider. While you're there make sure nothing is muted. Ok, that's it. That's all I have. My problem was that somehow, even though I never touched the darn thing, my Wave slider was all the way at the bottom. 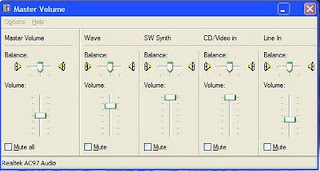 IF by some chance you cannot get to the Master Volume controller via the above instructions. You can try this: click Start then Help & Support. Type Master Volume in the search box and execute the search. It should return 2 matches. Click the one that says "Adjust the volume for multimedia playback devices". This should pull up information on adjusting it. 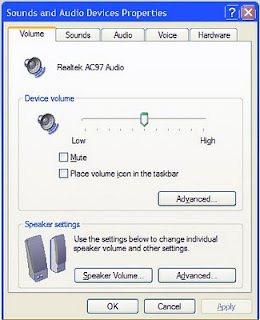 Simply click the link it provides called "Sounds and Audio Devices" and this should open up the properties box and then you can follow Fix 1 and 2 as stated above.